With a major intervention by a US-based Guyanese, the dream of one mother to see her daughter, born with clubfoot lead a normal life may soon be realised. Fifteen year-old Shebena Belle of Bladen Hall Multilateral was born with clubfoot. Clubfoot is a condition whereby the feet are twisted so that the soles cannot be placed flat on the ground. This condition prevented Shebena from walking properly. In fact, the teenager often dreamed of being able to walk normally for the first time in her life. She said that her greatest challenge is being able to traverse a number of stairways, noting that this is very difficult especially during her days at school. She however noted that in terms of discrimination, she doesn’t encounter such because her colleagues at school recognise that despite her physical disability, her performance academically is at a high standard. “I don’t see myself being different from them because I do everything that they do, so I know that my feet are somewhat different but I don’t allow that to affect me in any way,” she said. 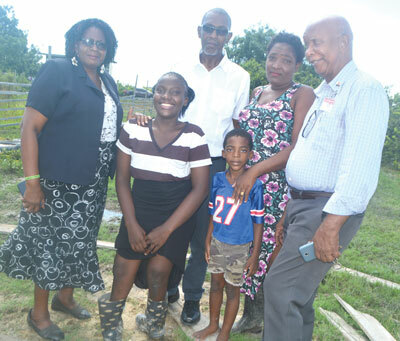 However in 2016, overseas-based Guyanese Dr. Slater Jeffery stepped forward to champion the cause for the fifteen year old. Dr. Jeffery disclosed that he was visiting Guyana on a mission of securing pigeon pea seeds. It was during his visit to Bare Root, East Coast Demerara, he met with the young girl. However, Jeffery fell ill with heart-related issues and required surgery. After undergoing successful heart surgery, he recognised that he is privileged to be alive and wanted to contribute to someone’s life in an equally meaningful way. As such, Dr. Jeffrey visited Dr. Claude B. Scott, a local surgeon at the Georgetown Public Hospital Corporation (GPHC). During the visit, the doctor learnt that to have the surgery done successfully a number of specialised tools would be needed. Since then, Dr. Jeffery and his team secured the equipment, which includes a Computed Radiography (CR) machine. Dr. Jeffery assured the family that regardless of what it takes, he is prepared and committed in ensuring that young Belle would be able to benefit from the surgery. He assured the Bladen Hall Multilateral third former that the surgery would be done in Guyana and would take place in March 2019. Dr. Jeffery noted too that a medical team would be in Guyana to ensure that the surgery is completed. He expressed confidence that Belle would walk normal after the surgery. According to the visiting US -based Guyanese, the team of experts have had a very long history of performing such successful surgeries, and they will perform the surgery on Belle. He said that after the surgery, the equipment would be donated to the GPHC, to make it easy for other persons plagued with similar challenges to have corrective surgery. After visiting the GPHC, Dr. Jeffrey said that he was made aware that at least 100 persons are in need of similar surgeries. Meanwhile, the teenager expressed her thanks to Dr. Jeffrey, stating that the thought of being able to walk properly for the first time in her life has certainly made her very emotional. “I am very thankful right now and I would like to say that you don’t have any idea how much you folks have touched me. I feel so overwhelmed right now as this is a dream come true and I pray that God will bless each one of you,” a teary-eyed Belle said. At the same time, Belle’s mother said that she is thankful for the assistance. She singled out her husband who she said played an exceptional role from her birth. She said that on many occasions, her husband would literally carry his daughter in his arms or on his back as he has supported her morally.